Since I do not do market forecasting, my comments on the actual state of bond markets have been sporadic. I just want to refresh my views, particularly since I have had a recent increase in readership. Although writing a book on recessions obviously skews my thinking, my argument is straightforward: the U.S. Treasury curve is priced so that the next big move is down, and the likely trigger for cuts would be a recession. That recession need not be imminent; if we look at the 10-year (as above), it just has to hit in the next 9 years or so. Since that view is somewhat obvious, I will not belabour the point. At the moment, I am slogging through the deep theory parts of my book, and will return to the empirical side of recessions. At that point, I will have more interesting charts to share (although my book will likely truncate discussions to data ending in 2018). Fixed investment in the United States has not been extraordinarily strong, so the advantage is that there is less need for drastic cutbacks. If one wants to sound like an internet Austrian, if investment is low, the scope for malinvestment is necessarily smaller. Nevertheless, we live in a world dominated by multinational corporations; disruptions could hit from any quarter (and this sensitivity goes beyond the conventional way of assessing the openness of an economy by looking at trade flows). However, one needs to only look at the 1998 episode (note the curve inversion in the chart above) to see an example of the United States shrugging off overseas turmoil (the Asian Crisis). The downside to yields is determined by one's assessment of recession odds. What about the upside? The Federal Reserve has been very transparent, and acting exactly like New Keynesian theory suggests they should. They believe their models, and their models assume that interest rates are a powerful lever for economic trends. The economy is stuck in some form of steady state, and so the level of the policy rate is not going to be far where the models would estimate is supposed to be. The data have wiggles, perhaps seasonality issues created by the Financial Crisis persist. It would not take much to get Fed policymakers to be more optimistic. That said, the glacial pace of rate hikes suggests that it would take a really long time to get the overnight rate to 4%. Realistically, either a change in personnel at the Fed -- or a reaction to a hefty loosening of fiscal policy -- is the main scare stories for big movements in bond yields. Such changes have precedents, but you cannot forecast them by reading the tea leaves of time series. Incidentally, the current configuration could be seen as a vindication of Modern Monetary Theory. 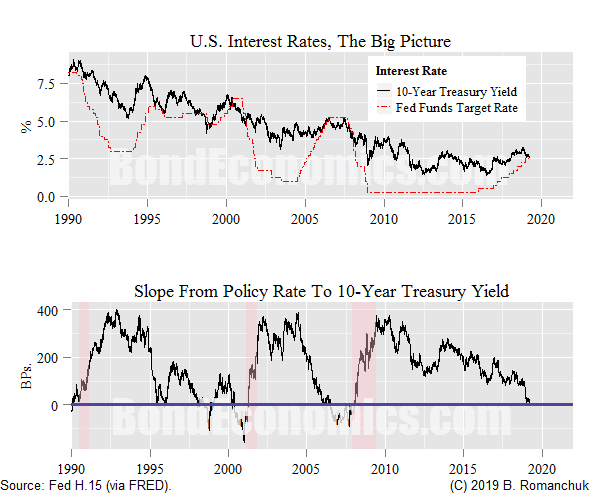 If one assumes that interest rate policy is not particularly potent, relatively tight fiscal policy will eventually smash the policy rate to the zero lower bound. If the real world does not resemble neoclassical model dynamics, the estimated neutral rate ends up acting like a moving average of historical rates. Unless we get a personnel change at the central bank, we end up with observed rates chugging along at low levels. Unless something big injects some excitement into the system, the policy rate will look like a long-term moving average of the historical policy rate. In turn, that becomes the mean to which bond yields revert to. * Recessions are just a downturn in activity. There's a lot of ways that this can happen, such as a hefty fiscal tightening. However, what we are interested here are recessions that are the natural result of the processes of industrial capitalism. Hi Brian, this is a bit off topic but since you worked in fixed income money management, can you comment on how guys like Gundlach or PIMCO make money? Are they consistently getting their macro calls right? Or is that more marketing stuff for TV to raise AUM and they're consistently making money off the structure of their portfolio? Unless they have hedge funds, the firm charges a fee based on a small percentage of assets. For a fund that invests in investment grade bonds without leverage, returns are bond-like, and so the growth mainly comes from getting new money in. The portfolio managers/traders will get bonuses based on performance. For people in the public eye, like Gundlach, you need to remember that they have a ficuciary duty to their investors. Whatever they say has to benefit those investors, so they are “talking their book.” They have no choice in the matter, so I just take what they say with a grain of salt. My experience, based on Canadian firms, was that nobody reliably made any money in size on duration calls. People made money off spreads, and relative value. I don’t think the US experience is much different. The little I know about PIMCO was that they made their name in mortgage bond trading, and expanded from there. However, people want to hear about the direction of interest rates, so that’s what people talk about in interviews. Hi Brian thanks for the reply. I was just wondering because I read somewhere that Pimco takes advantage of the "structure" of their portfolio to consistently make returns above their Barclay's AGG benchmark for their Total Return portfolio. i.e. sell out of money options on parts of their portfolio and reinvest the premiums for a carry as an example. I'm so used to seeing active funds consistently under perform their respective benchmarks it was a surprise to see PIMCO beating it consistently. I do however see some outlier years (during QE) where they strongly outperformed which I'm guessing is a correct bet on direction of rates from QE. That’s relative value. For example, if mortgage-backed securities (MBS) always trade cheap relative to their hedging instruments (which I think was the case, but the US-style MBS don’t exist in Canada, so no experience), then you structure your portfolio with an overweight MBS position, and hedge out the risk. If everything goes according to plan, you pocket the profits you locked in over time. There were tons of mispricings after the Financial Crisis (courtesy of distressed sellers), so anyone with liquidity could put up stellar oerformance without taking big risks. So I have no idea what was going on with them, but outliers are not surprising. So basically the large bond funds that do beat their benchmarks are employing LTCM style relative value strategies (but without much or any leverage). The Macro talk is mostly marketing talk (think El Erian or Gross talking about the economy/Fed) while the meat of the excess returns are from quant analysts. Do you have any speculative guesses what Renaissance Technology type places are doing? Yes; everybody does relative value, but the usual way to do that is be overweight credit. No idea about Renaissance.